Living Social is a daily deal site that I recently discovered and I am loving it. And today they have a great deal that I knew many of you would love. 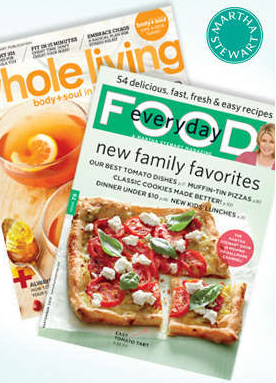 Only through today Living Social is offering a full year’s subscription for both Whole Living and Everyday Food Magazine for only $10. Yes, that is both magazines for $10. I have posted many times how much I love Martha Stewart’s Everyday Food Magazine. And this is a great deal. If you’re new to Living Social, click here to sign up, with your email. Then choose East Valley, Az to order and then in one day, you will receive a voucher to alert you your deal is ready to redeem.